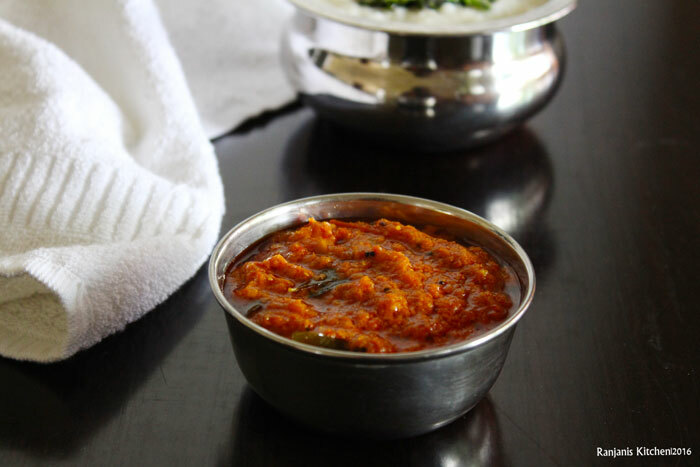 Thakkali thokku recipe using coconut. A recipe learned from mom. She used to prepare frequently for idli, dosa and especially for curd rice. 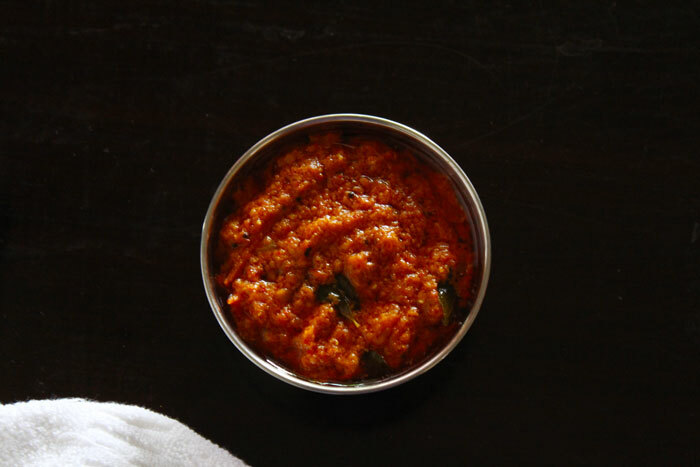 I love this tomato thokku for curd rice. Sesame oil is best to make this thokku. This Thakkali thokku will remain good for 3 days if refrigerated. Wash tomatoes and chop into fine pieces. Grind Red chili, coriander seeds and fennel seeds to a coarse powder. Then add coconut and little water. Grind to a fine paste. Heat a kadai, add gingelly oil (Sesame oil) and season with mustard and curry leaves. Add chopped onions, salt and turmeric powder. Saute in medium low flame till it becomes completely mushy. You can cook covered with lid also. Add grounded paste and stir well. Cook in medium low flame till the oil floats on top. Use gingelly oil (Sesame oil) to get the perfect taste of this thokku. Adjust chilies for your spice level. You can refrigerate this thokku for 3 days to use. Grind red chillies, coriander seeds and fennel seeds to coarse powder. Add shredded coconut to the coarse powder. Add some water and grind to a fine paste. Heat a pan, add oil and season with mustard and curry leaves. Add chopped tomatoes, turmeric powder and salt. cook till the tomatoes get completely cooked. Add grounded paste to it. cook covered in medium low flame till the oil floats on top.